« boston wears spring well. i don’t. 6:00 am: J&T to hospital. mom texts, 6:55am: still waiting for the pitocin to be given. nothing since. will share any news. there’s going to be a baby today! mom texts, 8:08am: still waiting. IV in though. me thinking: what’s up with the duplicate texts? the messages were exactly the same and received at exactly the same time. mom is not at hospital with J, right? this must be bending some sort of generational, space, time, ESP continuums. me thinking: ah! this is so exciting! and hopefully not too painful for J. must tell her that i’m thinking of her basically every minute. J texts, 9:15 am: thanks :) just starting to feel contractions. Yikes! my stomach wiggles painfully in sympathy. and empathy. and relief because i’m SO glad all i have to do is CHEER from the sidelines and not PUSH out a baby. mom texts, 9:16 am: jen says she’s updating u.
me thinking: guess that explains the duplicate texts. mom didn’t know i was in touch with the horse’s mouth, the source, the mama to be, my sister. and why didn’t she know that? isn’t she at the hospital? must find out. mom texts, 9:19 am: no…playing bridge. me thinking: way to keep your eye on the prize, gram. also, you should stop texting me and focus on your cards. and self, focus on work. J texts, 10:13am: at the hospital waiting for the pitocin to be started :) hopefully she won’t be too long in arriving! love to all -j&t. me thinking: ok, mass text has been sent. i don’t need to inform anyone. but wait, what? i thought the pitocin was already in or given or administered or HUH? demands clarification from sister, as if that’s the most important thing she has to do today. J texts, 10:19 am: pitocin is in an IV so it is a continuous dose that they up every fifteen or so mins. i am geeting (sic) about five times the original dose now to move the progress along to dilate the cervix. the contractions will get stronger and more painful the longer we go. me thinking: i talked about being induced last night with a friend whose wife was induced. she was given the drugs at 7am and by 5pm, baby was born. asks J if this is the same time table she is expecting. J texts, 10:21 am: yep :). me thinking: she’s smiling now, but i don’t know if that smile will hold on as the contractions get stronger. i suppose it’s my duty as an aunt to keep the smile bright. IT’S ON. mom texts, 10:39am: keep upping the dose. five times the original amount. contractions still every two to three mins. me thinking: i am nervous. and excited. i don’t know if i’ve ever been this involved in a birth. and frankly, i’m still not very involved. i am a fan of an aunt’s eye view. less mess. less clean up. me thinking: haven’t heard much lately. must bug J to see what’s happening. me thinking: WOAH. mom’s playing cards. J’s playing cards. this kid is going to come out holding a royal flush. me thinking: does J have to do the crazy breathing stuff when a contractions hits? what does a contraction feel like? what game is she playing? is she winning? J texts, 12:12pm: no. they don’t do that anymore :) just slow controlled breathing. feels like a vise around my middle. playing up and down but not keeping score. me thinking: can J eat? does she even get hungry? must confirm. judging from the fact that i got that text message (which spanned 2 texts, thank you ATT to VZW) twice, i’d say she is feeling GOOD. and oh, another message! gina tweeting, 2:00pm: @pebbleinmyshoe @mumfusa Hello, #BabyMacWhereAreYou?! mom texts, 3:21pm: going well. jen’s napping a bit now. epidurals helping a lot. no new progression on dilation when they checked an hour ago but she’s been having really good contractions since then so hopefully we’ll see some progress. me thinking: someone needs to define a good contraction. they all seem BAD and PAINFUL to me. especially if progression is the end result. i’m thinking good = BAD. in other news, this waiting is so not cool. every time my phone buzzes, i think THIS IS IT. but it’s not. what an emotional roller coaster. maybe i should take a nap too? me thinking: i’m so glad it’s a slow at work today because, clearly, a running blog of jen’s day of labor is a vital thing to be doing. you know, it’s just me doing my aunt duties. you’re welcome. it’s also helping with this waiting because other than THINKING and TWEETING, i don’t have any outlets. it’s just me waiting and waiting and waiting. and waiting and waiting and waiting some more. oh, did i mention that yesterday i got a postcard from MMM (in WA)? yeah, she sets the bar really high as far as nieces go. baby mac, you paying attention? 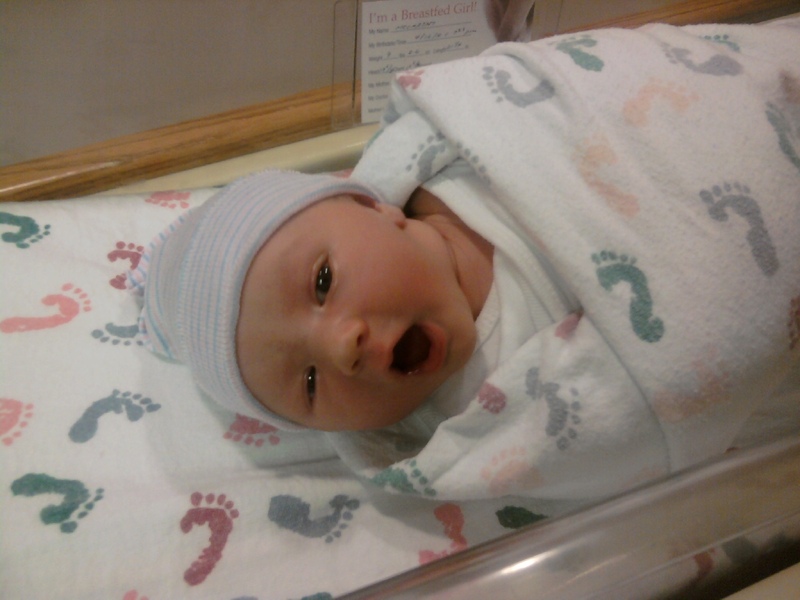 emma tweeting, 3:35pm: @ebeckman @mumfusa are you going down this weekend to meet the new niece? so exciting! can’t wait for more details! me thinking: i need to do something while i wait. i’ll tweet. me thinking: it’s been awhile since the last update. but don’t want to wake a certain person up from a certain nap she’s taking. WAIT A SECOND. is baby mac sleeping now? do babies sleep during birth or, you know, the part leading up to the point where you’re squished out of the birth canal? anyways, call mom for updates. nothing. wait until 4:47pm and send text to mama and papa to be. HOW GOES IT? you know, us in the peanut gallery need to be in the know. and currently, we’re not. mom texts, 4:48pm: slow progress. just checked her. still about 3-4cm dilated but considerable improvement in effacement. me thinking: gah! this labor thing takes forever. and i’m not mincing any words. i’m at approximately 1405 words. in other news, dilated is hard to spell. every single time i’ve gone to type it today, i’ve tried to spell it dialated. it makes more sense, don’t you think? ho hum. i wait on. me thinking: I KNOW. you’re tired of the me thinking, me tweeting posts. I KNOW. i want some bolded, texted updates too. you and me both, BLOG. you and me both. T texts, 5:49pm: just checked again. the doctor doesn’t think she’s progressing all that fast so looking more likely that we may be going to a c-section. she’ll check again in about an hour. we’d appreciate everyone’s prayers right now. thanks. me thinking: yikes. this sounds serious. must call brother for another opinion. he’s been through this birthing process 3x already. brother does his duty. i hang up feeling better. T texts, 6:50pm: so looks like we’re heading into c-section in the next hour. little miss is deciding to take the express exit. we’ll keep you updated. as always please keep the prayers coming. we love you all! mom texts, 7:24pm: heading to hospital now. jen’s having a c-section momentarily. me thinking, dialing: hello, is everything alright? mom texts, 8:14pm: she’s here. 9lbs. 2oz. still waiting for name. me thinking: YAY! how’s J? mom texts, 8:19pm: J’s in recovery. we’re looking in the nursery with T.
sister E texts, 8:22pm: two very cell phoney pics arrive. (read: difficult to see). one of baby mac. and one of papa T and baby mac. sister E texts, 8:24pm: can’t yet. tina (sic) good, haven’t seen J yet and i can’t see her (baby mac’s) face yet :( but T is already poking fun at her cone head. me thinking: tina? who’s tina? baby mac is tina? nurse tina? tim with a typo? needs confirmation. sister E texts, 8:26pm: tina is tim. typo. me thinking: what’s the delay in introducing the name? sister E texts, 8:27pm: surprise? sister E texts 8:29pm: another pic of papa T and baby mac. me thinking, squealing: AWWWW. i wish i was there. soooooooo bad. me thinking: name, name, name? sister E texts, 8:45pm: none, none, none. :( still in the dark. me thinking: how come no one can hold the baby? maybe it’s because J has to be the first one to hold her? mom texts, 9:24 pm: KAELYN ROSE MCCARTHY. 9lbs, 4oz. 21-1/4″. mom and baby doing well. jen had a c-section. welcome to earth, miss kaelyn! This entry was posted on April 16, 2010 at 11:11 pm and is filed under general. You can follow any responses to this entry through the RSS 2.0 feed. You can leave a response, or trackback from your own site. whew! just read this. i was getting anxious all over again just reading it! :) SO glad everything went well! J and T and baby Kaelyn will love reading this over and over again and reminiscing :) Nice work, auntie! Now don’t forget to send more pictures when they come. THANK YOU. you are too cute. has anyone told you lately that you rock? what a day! congrats all around. kaelyn is very cute. and i don’t say that about a lot of babies! thanks! she is precious. and i get to meet her tonight. i am BEYOND excited. expect more pictures in the near future.